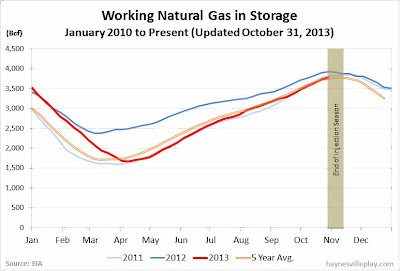 The weekly EIA weekly storage report showed a 38 Bcf net injection, bringing the total working gas in storage up to 3.779 Tcf. The weekly injection was 42% below last year (+66 Bcf) and 33% below the five year average (+57 Bcf). 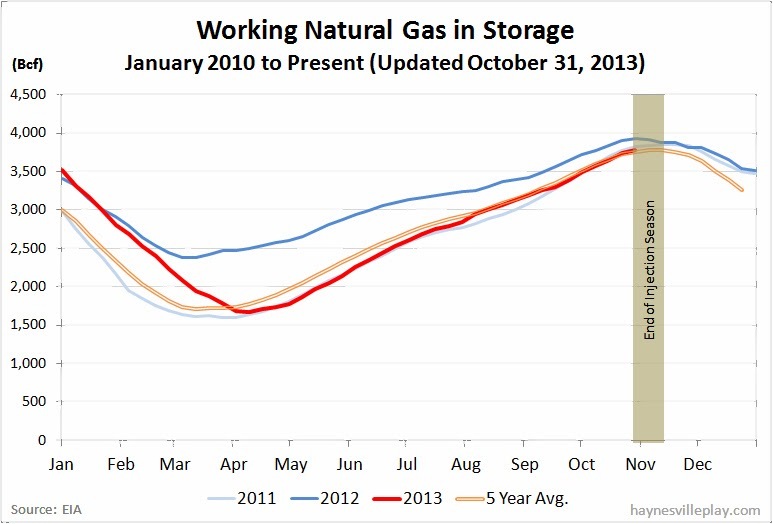 The current storage level is now 3.1% below last year (3.899 Tcf) but 1.6% above the five year average (3.721 Tcf). I believe this marks the first year in the past four or five where we didn't set or at least flirt with a new maximum storage record. Feels nice to be able to breathe more comfortably this time of year. Temperatures last week averaged 52.9 degrees in the Lower 48, which was 5.4 degrees cooler than last year and 1.9 degrees cooler than average.